Sixteen-year-old Hamidullah Qadri was a happy young man after he helped Derbyshire win their first championship game since July 2015. He took 5 for 60 in Glamorgan’s second innings, and said afterwards that it was honour to be asked to lead the team off. He said: “It was a real honour, especially as it was my debut and we hadn’t won for two years. I haven’t played on a turning pitch for some time, and I took every opportunity to back my skills. 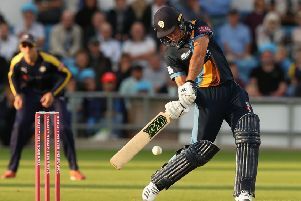 Qadri, who plays for the Alvaston and Boulton club, where former Derbyshire Steve Stubbings is the captain, is now looking forward to meeting Imran Tahir, who joins Derbyshire for the remainder of the season. ”He is world class, and he will be able to teach me a lot, although I must thank Jeevan Mendis, who was very supportive during the game, and it was fitting he took the final catch off my bowling in his last game of the club,” he said.